My coworker, Misty, from a previous life (okay, okay, from last week when I was still working as a research analyst) has started her own Etsy shop! 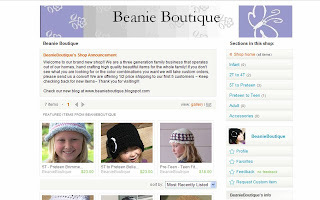 Beanie Boutique. Hooray! She and her family make very cute beanies for all... mostly for little ones but I'm sure you can ask her for a custom "grown up" version too. She's a sweet and talented lady and I am so excited she's putting some of that talent to use. Definitely check her out if you'd like to doll up your little girl's head with some cute and functional beanies. Congrats, Misty, for starting your own shop!